Go find a and have some green beer with him and his pot of gold (maybe you can get him to buy… I mean, he does have a pot of gold). How could I have a blog entry about it without a link on How To make it. 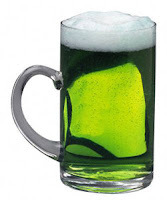 Saint Patrick’s Day (Irish: Lá ’le Pádraig or Lá Fhéile Pádraig), colloquially St. Paddy’s Day or Paddy’s Day, is an annual feast day which celebrates Saint Patrick (circa 385–461), one of the patron saints of Ireland. And then Sunday we all visited the Easter Bunny! This entry was posted in Catching Up, Day in History, Pictures, Tips and Tricks on March 17, 2008 by Eric T..